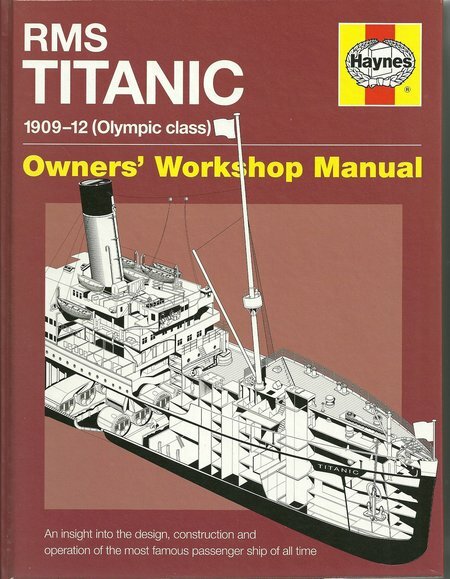 DESCRIPTION: This book may be stretching the concept of owners’ workshop manuals, but the format does provide a very good review of RMS Titanic with a considerable amount of information, presented in a very readable way with first class illustration. The Titanic has become an enduring subject for all the wrong reasons. Mountains of books have been written about her and the tragic incident, which ended with her sinking. There have been conspiracy theories, novels based on the story, fortunes spent locating her on the seabed, examination of the known facts from every conceivable angle and yet more books continue to be published and most sell very well. There are few subjects that produce such a thirst for information. What has not been covered before in print is a comprehensive review of the technology of the vessel, and few books before this manual have included adequate illustration by drawing and photograph. When Titanic sailed on her fateful voyage, the steam passenger liner was in its golden period. There was no other way of connecting Europe and North America with fast passage. Steamship Lines competed to offer the fastest crossings and the most opulent accommodation, but they also provided some very basic accommodation for immigrants leaving Europe for a new life in America. This environment encouraged shipyards to work to, and beyond, the limits of current technology. It encouraged shipping lines to over sell their ships with extravagant claims, It encouraged captains to take risks in an attempt to beat the existing record for a crossing, and it encouraged overcrowding to squeeze the maximum profit from each voyage. The Titanic was unfortunate in combining those ills in a single voyage. There continues to be debate about the factors that caused the great ship to sink. There are claims that the rivets, which secured the plates making the hull, were defective. The methods of quality assurance at the time of her building left something to be desired. There are claims that the Captain made a critical error in attempting to avoid the iceberg rather than hitting it head on. There have been claims that the lookouts were not relieved frequently and suffered reduced concentration as a result of cold and fatigue. Some have been critical of the officers in managing the evacuation of passengers and crew, and of the number of places available in lifeboats. There have been accusations that the lack of radio signalling standards resulted in confusion when the Titanic’s operators used incorrect emergency codes and when an American ship used US Morse code rather than international Morse. In the end, the tragedy was a combination of factors that was just bad luck. A different combination could have resulted in the ship not sinking, or for a greater number of survivors. The tragedy was compounded because it had been claimed that she was unsinkable. That was a marketing error because no craft built of materials heavier than water can truly be unsinkable under all possible conditions. It has been said that the 15 watertight bulkheads were not carried high enough. Under the actual conditions, resulting from impact with the iceberg, this was true, although in designing a practically unsinkable vessel, the naval architect and the builders had made assumptions about how many compartments would be holed and how much water would ingress quickly. In the most probable collision with another ship, the damage would not have allowed in enough water to overwhelm the first bulkhead and then progressively overwhelm the neighbouring bulkheads. In the final analysis, the design was a compromise between cost and functionality. The construction was constrained by the quality control methods in common use in shipyards and foundries. The shipping line give in to the profit motive and loaded more passengers than there was lifeboat capacity for in the event of an emergency. In this manual, the story is outlined and the technology uniquely reviewed to make a fascinating book that every Titanic enthusiast will want to read. It shows that the Titanic was not remarkable for her time in any way other than her size. The second member of the Olympic Class, Titanic used design, technology and construction that had successfully been applied to smaller vessels. To build these two large passenger ships, Harland and Wolff had to build new slipways and add hydraulic rams to assist the launchings. In the manual, over 200 high-grade illustrations help to explain all of the features of the Titanic and her construction. Although the reader may wonder at the sub title of Owners’ Workshop Manual, but the Haynes format is fully vindicated as a unique contribution to the fund of knowledge now available on what was the major tragedy of the Edwardian period.